Was meint ihr dazu? Sieht zwar noch etwas schlicht aus aber ich bin über jedes RPG froh! Sieht doch richtig gut aus mal die tests abwarten, kommt aber sicher nich in europa raus, aber daran solls nicht scheitern wirds halt importiert. sieht irgendwie nach golden sun aus, aber da golden sun gut is, wirds vielleicht auch gut. Der Kampfscreen gefällt mir. Die Perspektive hat was und die 2 Bildschirme werden auch cool genutzt. Und sonst sind Lunar Spiele eigentlich immer spaßig gewesen. Ich freu mich auf jeden Fall schon. Sieht nicht schlecht aus. Gute Aufteilung der Screens. world of warcraft für den ds kommt bald!!! ich kaufs mir wann is release? # From the original creators of Lunar: The Silver Star! # Exclusive RPG for the Nintendo DS platform. # First RPG for the Nintendo DS platform. # Discover the events prior to Lunar: Silver Star Story in an epic prequel storyline, involving all new characters in the Lunar universe. # Players must battle the forces of evil by transforming Dark enemy creatures into beings of Light. # New characters: Three new main characters make their debut to the Lunar universe. # New Battle Card system: Find different Battle Cards during your quest to augment the abilities and powers of members in your party. # New weapons and items: Lunar: Dragon Song features all-new items and weapons never seen before in any Lunar title. # Wireless LAN connectivity: Players can connect via wireless LAN to share rare and unique items within the Lunar DS world. Aber die infos sind nett. Wenns noch viele sidequests gibt, ist es schon gekauft. UbiSoft hat viele neue Informationen zu "Lunar DS" bekannt gegeben. Der offizielle Name des Spieles wird "Lunar: Dragon Song" lauten. Das Spiel wird ein Prequel sein und 1000 Jahre vor "Lunar: The Silver Star" angesiedelt sein. Unsere Party besteht aus drei neuen Charakteren: Jian, Lucia und Gabriel. Während des Abenteuers muss der Spieler "Forces of Darkness" in "Beings of Light" konvertieren. Dafür wird man "Battle Cards" sammeln können mit denen die Eigenschaften, Magie und Attacken verbessert werden können. Diese Karten können auch per WiFi getauscht werden. Außerdem soll es natürlich auch neue Waffen und Items geben. Das beste zum Schluß: Auf UbiSofts Seite wird das Releasedatum mit "Juli" angegeben. ich kaufs mir zu 100%. die grafik ist zwar schlciht, gefällt mir aber trotzdem sehr. Sind Lunar Genesis und Lunar Dragon Song dass gleiche Spiel oder völlig unterschiedliche? Wenn sie unterschiedlich sind dann hoffe ich dass wenigstens Lunar Genesis ein 3D Rollenspiel wird! 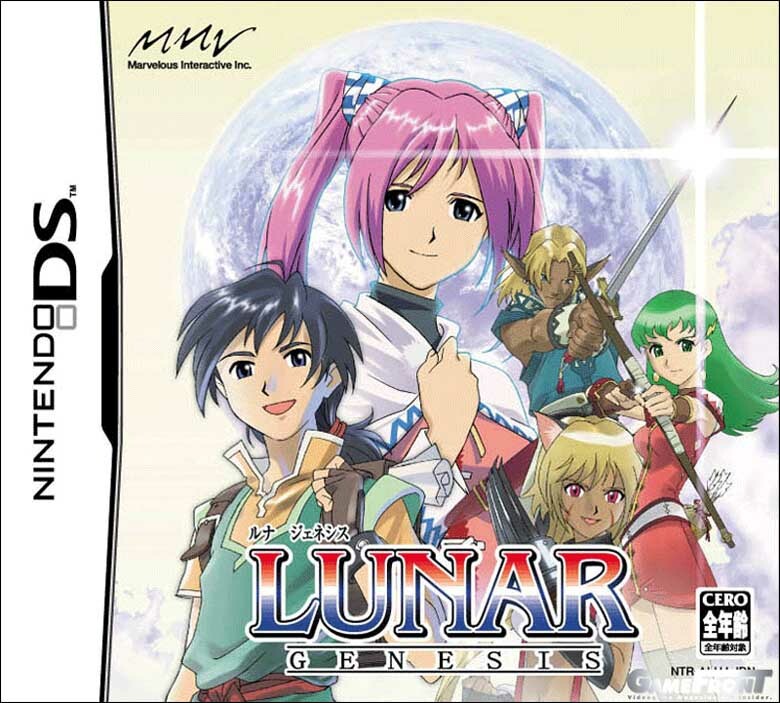 June 9, 2005 - Following months of speculation, the true nature of the Nintendo DS Lunar title has at last come to light. The latest issue of Famitsu reveals that the game, fully titled Lunar Genesis, is indeed the latest entry in the classic GameArts Sega CD RPG series. GameArts is handling development on the title, with Marvelous Interactive serving as publisher in Japan. Lunar Genesis serves as a prequel in the series, taking place one thousand years prior to the 1992 original Lunar: The Silver Star. The background story for the world of Lunar centers on a distant past -- a time when the world was dead and even the sky did not exist. The goddess Altena gives rebirth to the world and had four dragons act as its protector. When things advance to the time of Lunar Genesis, two dominant species exist in the world, intelligent humans and strong beasts. The game's main character is Gien Campbell, a fifteen-year-old human who lives in the port town of Seirus. He's joined by a fourteen-year-old female counterpart, Lucia Collins, who serves as the heroine of the title and has a sibling-like relationship with Gein. Also introduced in this first look at the game is Gabriel Ryan, a fifteen-year-old beast who hates to lose. You start off in Seirus, and by touching the stylus anywhere on the screen, you can make Gein and Lucia move around inside homes and shops. Rather than moving around town directly on your own, you select destinations directly from a menu, also with the stylus. The same type of movement holds true for the game's world map, as you select your next location by pointing with the stylus. Your first goal is to search for a job, which you find at a shop called Gado Express. Once you've gotten your first job, you purchase equipment from the equipment shop and head off for what will serve as the start of your adventure. While you have just one job available to you at the start of the game, more jobs are added to the Gado Express shop as the story progresses. You'll be able to find this shop in towns throughout the world, meaning side quests should be immediately accessible. When moving between towns, you'll find yourself working through fields of play, including forests and dungeons. Enemies chase you as you move about, and coming into contact with a foe will place you in battle. During battle, enemy groups are split into two groups: ground-based and flying. While flying enemies can only be killed with magic, if you take out the ground based enemies first, the flying enemies fall to the ground and can be attacked directly. Details on the battle system have yet to be revealed, but the game does seem to make good use of the DS's unique features. The screen is split in two, with most of the action seeming to take place on the bottom screen, presumably via stylus-based input. The DS's microphone is put to use with the game, as you can give commands to the characters via voice, ordering that they flee, for instance. With Lunar Genesis, we find ourselves hoping for a full-fledged RPG that lives up to the epic nature of its predecessors. Will Game Arts deliver? A Japanese release for the game is set for 8/25, so we'll find out soon enough! Ich hab mal ne Frage ist dass Spiel etwa dass selbe wie Lunar Dragon Song? Ja, es gab ja diese Online-Abstimmung, und die hat ergeben, dass Lunar Dragon Song das beste sei; Lunar Genesis war/ist einfach der Codename des Projektes. Das Spiel ist jetzt schon gekauft, die Lunar Spiele fand ich schon immer richtig toll. Gibt es eigentlich schon einen genauen Releasetermin für USA oder vielleicht sogar schon für EU? Man auf dass Spiel freue ich mich . Hoffentlich kommt es auch bei uns raus . Wieso heißt es denn jetzt wieder Lunar Genesis?